The Perfect Blend of Green Tea & Chocolate! Summary : Do you like chocolate? How about green tea? Well...do I have a tea for you. This tea from Adagio Teas is the perfect, and I mean pefect, blend of a light green tea taste with a strong chocolate flavor. Anyone who enjoys a chocolate tea should fall in love with this one! Review : It's cold. I'm somewhat depressed. I'm somewhat upset. So what's the remedy for all this? Well, there is lots of remedies I guess, but in the tea world that means one of two things for me...a good mint tea or a good chocolate tea. As I was a bit burnt out on mint teas, I hunted around my growing tea collection for anything that said "chocolate" on it. And I found what I was looking for in a tea from Adagio Teas called Cocomint Green Tea. Yes...talk about ideal. Chocolate and green tea. Who can resist? I mean, what a great way to get your antioxidants and satisfy your inner-chocolate lover at the same time. Here is how Adagio Teas explains this tea on their website : "Green tea from China with the delicate flavors of chocolate and mint. Makes a light and refreshing drink that's popular both hot and iced. If you are new to green tea, this lightly flavored tea may be a good place to start." So, let us start with the aroma of this tea. Any doubts I had that I might not like this tea evaporated when I pried the top of the tin the tea comes packaged in. Talk about a aroma of chocolate! Wow...what else can I say. Despite having green leaves, this tea has such a robus chocolate aroma that you could swear you are in a Nestle chocolate factory. And happily, very happily actually, this tea had a flavor to match this superb aroma. Unlike many green teas, the "grassy flavor" so often found in a green tea was mysteriously absent...thankfully. And the remaining green tea flavor that was there was "just right," having a light and subtle taste to it. What about the chocolate flavor you ask? Do I need to say it...this tea has a superb chocolate flavor! Very strong. Very potent. And it mixes absolutely perfectly with the light green tea taste. Take my word for it...if you like other chocolate teas you'll absolutely love this one. Period. If you have been "suckered" in by other chocolate teas, only to come away sadly disappointed, please take my advice and try this one...ok? Many chocolate teas are made with black tea leaves...instead of green. I've found this makes kind of a bad mixing...as the flavor of black tea is just so strong...it tends to hide the chocolate flavor. And all too often you'll get a bitter taste as your reward for choking the tea down. Not exactly a happy marriage if you ask me. Happily, this "bitterness" and "lack of chocolate flavor" is totally avoided in this tea. This is a chocolate tea...pure and simple. Truth be told, it is about as close to munching on a piece of chocolate as I've ever had in a tea...let alone a green tea. Overall, if you love chocolate teas...head over to Adagio Teas and get this tea. Now! And if you don't like other green teas due to it's sometimes grassy flavor...trust me...you will NOT find your typical green tea "grass" flavor here. The green tea flavor is light, subtle and even a bit sweet due to the chocolate. In short...this green tea is an ideal green tea to drink for just about anyone, unless, of course, you don't like chocolate! Recommendation : Absolutely. This tea from Adagio Teas is a superb tea for anyone who loves chocolate! And if you want to have your antioxidants and chocolate too, this is by all means the perfect tea to start out with. And if you are new to green tea, may I humbly suggest you try this tea first? The light taste and strong chocolate flavor, with no "grassy taste" sometimes found in green tea, make this an ideal "new green tea drinkers" tea. 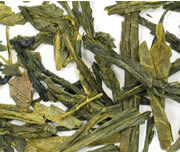 Adagio Teas White Monkey Green Tea : A very light colored and light tasting green tea. Traditional green tea drinkers will enjoy this tea.